"I bought the new 5K iMac and it's awesome. Everything is perfect except for one thing, it has no DVD drive. So I tried to rip DVD to iMac 5K with Handbrake but result in videos without sound. Does anyone know why or have any suggestions?" The new iMac 5K Retina is paired with various dazzling highlights, among which the stunning 27-inch Retina 5K display comes first. The display boosts the resolution from 2560 x 1440 to a staggering 5120 x 2880 pixels, delivering 67% more pixels than a 4K display. If you have got a 5K iMac, the first spark that flashes into your mind will surely be to play high-definition videos, and even better, HD DVDs on the 5K Retina display. Unfortunately, iMac 5K users will encounter a big obstacle if they wanna play DVD on iMac 5K as Apple gives up DVD drive for the new thinner profile. Don't worry, here we introduces an simple solution to easily copy DVD to iMac 5K. A trust worthy DVD ripper for iMac 5K can help users copy and rip DVD to iMac 5K with greatest quality. However, as mentioned above, an inappropriate DVD copy software may result in unsatisfactory results. As a matter of fact, most of the DVD rippers online like Handbrake, VLC etc have the ability to copy and rip common DVDs, but only crushes or partyly rips DVD with poor quality when it comes to some commercial DVDs like those produced by Disney, Paramount, Warner Brothers etc which are strictly copy protections. Here a professional DVD copy software for iMac 5K named MacX DVD Ripper Pro is highly recommended. With High Quality Engine, it can backup DVD to iMac 5K in ISO image, MKV and MPEG-2 with 1:1 image quality, copy DVD to iTunes, Macbook Air/Pro, rip DVDs to iPhone, iPad, Android and other latest devices, convert DVDs to MP4, AVI, MOV, WMV, MKV, etc as well as full capability to remove DVD CSS, region code, RCE, Sony ArccOS, UOPs, Disney, etc. In other words, with this iMac 5K DVD ripper, you can freely put any DVD movies, like the recently hot Disney Captain America 3, Disney The BFG, Zootopia, Finding Dory, etc with no hassle. 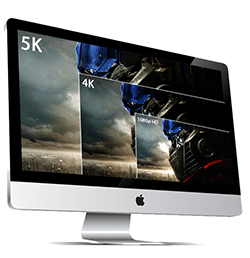 Step 1: Download and launch this DVD ripper for iMac 5K. Click "DVD" to load the DVD you want to transfer to iMac 5K. Step 2: Choose the output format. To transfer DVD to iMac 5K, you can just choose "DVD Backup" button to copy DVD to iMac with 1:1 image quality (MPEG-2 format and 5.1 channels Dolby AC3/DTS audio), or you may choose to convert DVD movies to MOV video file to play it on the new iMac 5k with the built-in QuickTime player. Note: This DVD copy software also allows you to rip and transfer DVD to iPhone, iPad, Samsung, Sony, Microsoft, Nokia, Huawei, etc by selecting the respective device profile from the list. Step 3: Click the "Browse" button to set the file to save the output video file. Step 4: Click "RUN" button to copy and rip DVD to iMac with Retina 5K Display. The whole process is 36x faster with no quality loss. 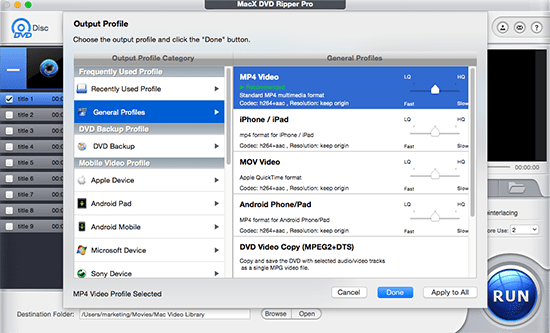 Notice: The DVD ripper developer only encourages you to use this DVD ripper to rip DVD to iMac 5K for legal personal use, instead of illegal reproduction or distribution of copyrighted content. Please obey your local DVD copyright law before doing it. DO NOT do harm to others' lawful rights and interests. If you simply want to put DVD on iMac 5K, there is another way to go. The multi-USB ports coming along with the iMac with Retina 5K Display make it possible for you to play DVD on iMac 5K with an external DVD player. Place an order an external DVD player on Amazon.com at night and you'll get it in the next day. After you get the DVD player, just plug it into a USB port at the back of iMac, insert your DVD movie and you can start enjoying DVD movies on iMac 5K. However, you should make sure that it supports iMac 5K or a driver may be required.